Thank you all for your feedback. 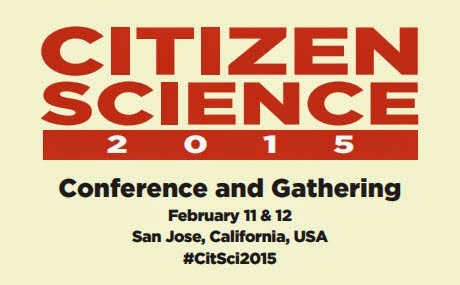 With your advice I put together, and submitted, a proposal for the upcoming Citizen Science 2015 conference. It's a favorite topic of mine and one that is essential to moving our field forward "For Love and Money: Business Models that support, benefit from, and share the rewards with, the work of citizen scientists." This is an ambitious talk for me but one I feel is important. In many ways I can only scratch the surface in a PowerPoint presentation to a conference room of citizen science professionals. But it will kick off a whole series of follow-up reports on this blog about the topic. There is much good background research that can't be included without overwhelming the audience, but is perfect for an online environment. There are also nuances, subtleties, and sub-categories of information that are vitally important and can't fit on a Powerpoint slide. But mostly I want to keep the conversation going long after the conference ends. I'm doing this in my strong belief that the citizen science community can make important discoveries and support research that provide value to profit-making companies, and they deserve to be rewarded for that service. But that money is also needed to support citizen science research and pay for investments that will expand what citizen scientists can do. Research costs money and it has to come from somewhere. Conferences also cost money. And in true citizen science fashion they are hoping to crowdfund through the company Razoo for a significant amount of support. I'm hugely appreciative of all the opportunities this conference provides so I'm happy to make a donation. Won't you join me? This conference is here to help you but they need your support. Give a little or give a lot, anything will help. See you in Palo Alto! One of the most important considerations you'll need to give to your business meeting is where you're going to hold it. Whether you are going to use a conference room in your own office or exploring potential alternatives, be sure that it fits the occasion. Play the game mahjong in the playground and have their own cards an the game that have free mahjong in the online market than click here mahjong free games online to get the game in the mahjong free game online. Thanks for sharing send flowers to Pakistan . Genuinely loved this kind of post. Sudoku is an amazing online game and this game I like sudoku online's latest one. You also try to play guys. Nice article you add there. Couponstechie also have such great deal to their users, get lorextechnology promo Codes and make a save money on shop security cameras. I should need to thank you for the undertakings you have made in encircling this article. I am confiding in a close best work from you later on as well. Keep sharing! Intending to survey your next post. I'm so glad to find this news here. Thank you for sharing! I at long last found the colossal post here. I will get back here. I just added your blog to my bookmark objectives. much esteemed. Quality presents are vital on welcome the guests t visit the site page, that is the thing that this site page is giving. I found your this post while looking at for some related data on blog search...It's a not all that awful post..keep posting and fortify the data. Thanks a million and please keep up the effective work. Your articles are to an extraordinary degree amazing and I got a broad extent of data and bearing understanding them Awesome Blog! you'd an amazing development in your article. The substance is unreasonably unprecedented. Nice post thanks for sharing Gifts to Pakistan .